Ever seen one of these while wandering around the local ponds? Obviously, this is the first I’ve actually been able to photograph one and quite frankly probably the first time I’ve ever seen one. If you haven’t already cheated by hovering over the picture, take a long look at it as if you were the first human that got to lay eyes on it. Being the first, you get the high honor of bestowing a strong yet distinctive name that all others that follow will use to proclaim their sighting. Maybe you went with Red Eye Flighter (the eye is actually more red than what shows on the shot above – the sunlight was amping up the orange tints), maybe Chimney Sweeper (cause of the soot look) or in a moment of stunted imagination, the Fluffy Floater. 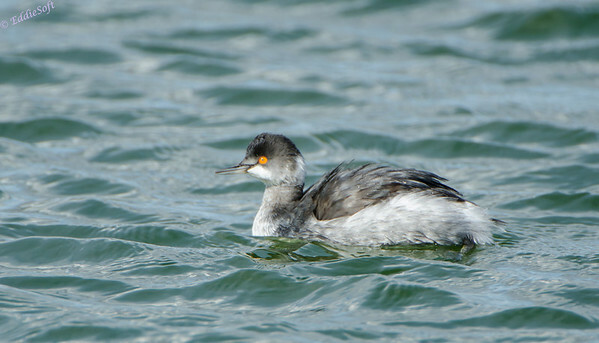 Well, it turns out whoever named this particular bird decided it should be called the Eared Grebe. If you are like me you probably rushed to Wikipedia or your closest bird reference book with an unquenchable thirst for the origins of this name. Of course, you could take the easy way out and just wait for me to tell you (ha). I’ll start out this post with a great big SIGH. When it comes to birds, I’ve developed some tricks over the years that help me out in the identification phase. These aids include capturing as many angles as I can, focusing on any unusual characteristics it might possesses and making sure to take a few snaps at any birds in the vicinity. Generally one of these will get me in the right ballpark and then it is just a matter of a little reading to narrow the two or three options to the right one… or rather the one I’m going with – ID are never guaranteed around here at LifeIntrigued and always graciously welcome a discussion should a reader come up with a differing opinion. Today’s post happens to be one of those situations where most of the tricks FAILED to deliver a quick answer. In fact, most of this month has been spent debating back and forth between all the reference manuals on my library shelf and any bird sites on the Internet that had something to say on the subject. No reason to keep this a mystery any longer. 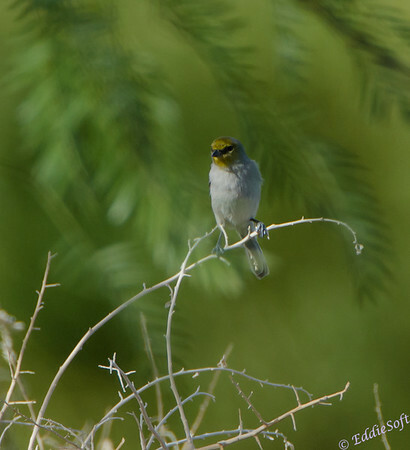 Again, heralding out of Henderson Nevada’s Bird Viewing Preserve we bring you a new bird to blog. This particular bird does have some unique features that should have made it very easy to identify. First and foremost, the long black beak seems like it should have narrowed the field significantly in itself. Turns out there a few birds that fit this characteristic. Hit the jump to continue following along with the identification process.. and see more pics! I’m fresh off another successful Bix@6! I wasn’t exactly feeling at the top of my game at the start, but made it through at a fairly good time for a training run (2 minutes faster than usual). Typically I come in 4 to 5 minutes slower than I do on actual race day. Always seemed a little odd to me but this year I figured out why – I took the phone with me this year (sans headphones – it isn’t really a closed course – no reason to take unnecessary risks), so the RunKeeper app kept me (and everyone around me hehehe) informed of the pace and distance. To my surprise, the 6-course is LONG. Not by a mile like the Chicago Marathon, but a few tenths enough to explain some of the time difference. I’m sure the rest of the time is due to adrenaline from being out there with 17K plus others. Not sure what to expect at the moment from the actual race, but the faster Bix@6 might just be a good sign – now if I can just get the cloud gods to cooperate again! Are you getting the picture (pun intended) the Henderson Bird Viewing Preserve is quite awesome when it comes to the diversity of birds available for photographing? At this point it is a little hard to rank this spot as my favorite thanks to the number of checks it has given me on the bird list or instead a lagoon in Florida where we were able to see less variety, but the larger species. Note, there is more to come of the Florida shoot but for now let’s spend some time with ANOTHER new bird from Henderson. 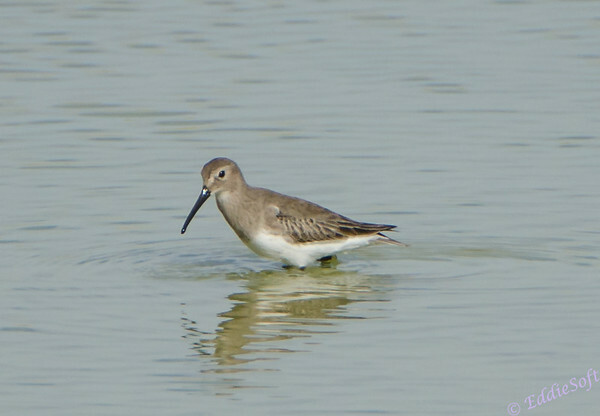 Anybody want to take a stab at what this interesting little waterfowl might be? No cheating by image hovering, but the post title might give a hint. Honestly, I thought this bird was simply a juvi of one of the other birds that were near it, but upon further research believe this to be a species unto its own. Better yet, a species that I can now check off my bird list. 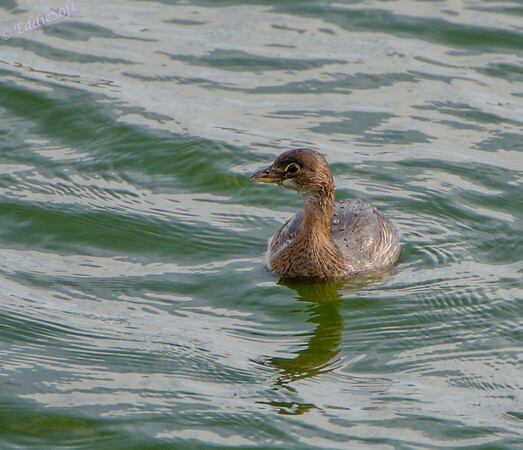 With the aid of the Stokes Field Guide, I was able to match the first two pictures with the adult Winter plumage of the Pied-Billed Grebe. The region matches up perfectly with our location and time frame so pretty confident the classification is correct. 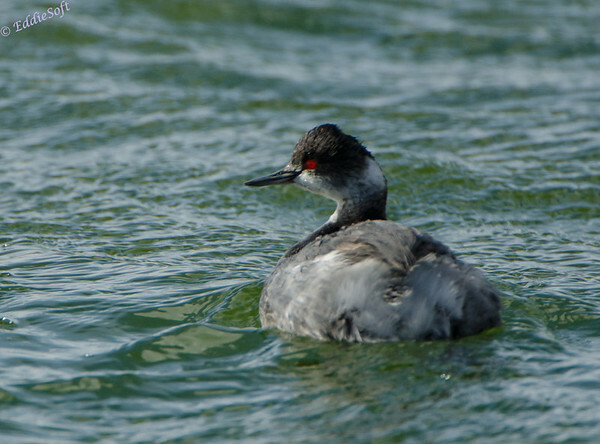 True to the old adage, I got the water beading up on the duck’s (er Grebe’s) back. Not to mention I was able to put a cross body shot in the tin as well. Greetings everyone. I am currently under the influence of my new deep tissue foot massager I just purchased with my 2nd place finish gift certificate (link here). As a result, I cannot be held accountable for the contents of this post because quite frankly, this feels quite yummy and might just dose off from time to time. Honestly, this thing is awesome! My main hope is it will help relieve some heel pain I’ve been dealing with since the Steamboat Race. A fellow runner at work recommended it so figured I’d give it a go00…zzzzzzzz … Sorry, dozed a bit. Today we are back at the Henderson Nevada Bird Viewing Preserve, but this time our primary subject doesn’t come with feathers or a beak. Turns out we were greeted with another resident in the area, one we were admittedly not expecting in the least. Surprise! 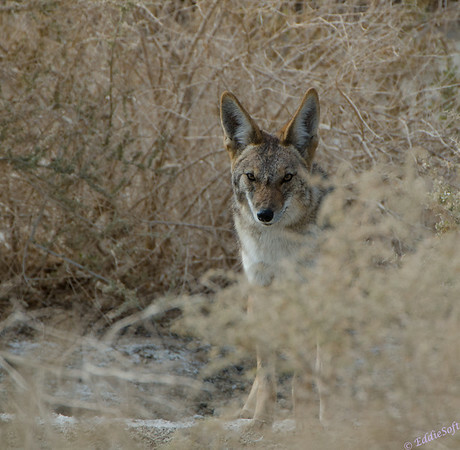 This Coyote crept up on us mid-morning while we were heading out to an observation platform built on one of the Henderson ponds. We were checking out some birds hanging out on one side of the raised walkway oblivious to the fact this natural born killer was stalking us from the other side. The color palette of this creature blended perfectly into the surroundings and if it wouldn’t have moved slightly I would have likely never seen it. Before the Beast could draw a bead on it (and thanks to taking the time to excitedly explain my find to Linda), the Coyote slinked back into the brush. Curious we started tracking it from the platform where it eventually popped into view again having traversed directly under it. Probably less than 20 yards away, it turned back at us – standing its ground against our unappreciated intrusion. As you can tell, it seemed truly pissed off! A quick look around confirmed we were the only ones out in preserve at the time which gets you to wondering if you were “take out” that day. This was going to be a little difficult if that was the intent because it didn’t appear to be “packing” – as in there wasn’t any other pack mates in the vicinity and it wasn’t sporting a holster we could see. In my excitement I failed to really take in the composition of the shot. 5 feet to the left would have helped the shots tremendously – note to self, composition, composition composition. This Coyote would walk a few feet, look back at us, walk a few feet, look back at us, veer off in a different direction, look back, return to the original direction and look back. This was getting pretty weird. Eventually it found its way behind a thick brush concealing most of what it was doing. All we could tell was that it was digging in the ground. A few minutes later it revealed its motivation. Happy 4th of July everyone! Hopefully you live in a state that trusts it’s serfs to know how to handle fire and thus can enjoy the holiday as it was meant to be – as opposed to some of us who are subject to state administrations that is more worried about someone lighting a firecracker than they are passing a budget that keeps the state out of debt — but I digress. In celebration of our independence from an oppressive government (hmmm starting to sound ironically familiar)… I bring you another great find at the Henderson Nevada Wildlife Viewing Preserve. This bird immediately brings to mind all the festive colors we typically associate with our proud country. Ummm okay, maybe not. Actually it doesn’t even seem to be that well associated to Independence Day now that I take another gander at it. Well, it sounded good anyway (editor’s note, for the record, it does look like it is “independent” in the since that it is alone – that way if I was for some reason to be called in front of a Congressional hearing I can say I was telling the truth unlike the Head of Intelligence who conveniently claims he “forgot” about the Patriot Act as his excuse for lying under oath – sorry, more digression). So, you are probably thinking this specimen is a Redhead Duck because that is exactly what I thought it was when I came up on it enjoying one of the ponds. It wasn’t until a few minutes ago that I realized that initial assumption was wrong. Based on validation with all my references, I have changed my classification to … a Canvasback. 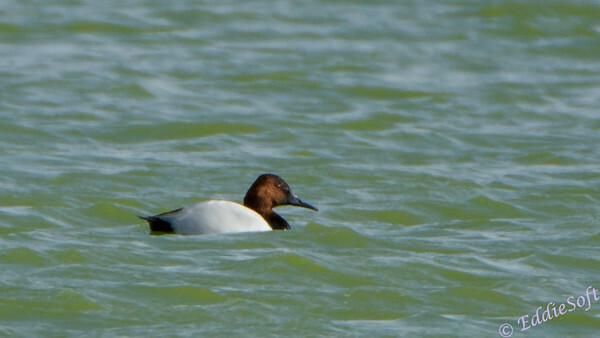 The Redhead and the Canvasback have almost identical color schemes – brownish heads and black highlighting at the same locations, but they differ in few key areas. First of all, the Redhead has a body feathering that is more gray contrasted with the Canvasback which has a much brighter/whiter coloring. A closer look at the beak also show differences with the Canvasback being pointier and darker instead of the blunter and more stylized bill sported by the other duck. They do have nearly identical region maps, but based on the other factors my money is on a Canvasback. For the detailed oriented people out there, the Canvasback is about 2 inches longer and a little larger weight wise, but that is impossible to distinguish in the field. Hit the jump read more about the Canvasback! Admittedly, when things get tight I go to my ace in the hole. 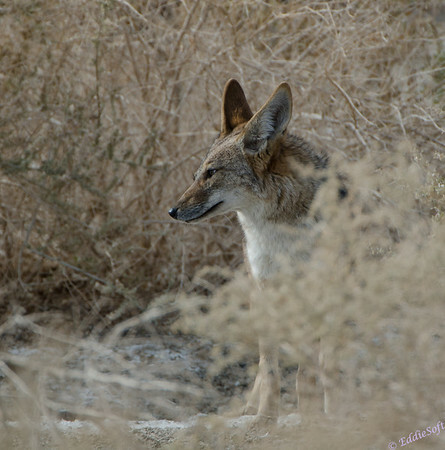 Lucky for me, I was able to finish processing all the shots from our first day at the Henderson Bird Viewing Preserve. If you recall, on our trip to Nevada last year we stopped in to that gem of a preserve. Per previous posts, this area already provided two blog posts for brand new birds to my collection – specifically, the Green-Winged Teal (link here) and the Greater Roadrunner (link here). Here’s a little secret. Those were not the only two new birds this shoot produced! 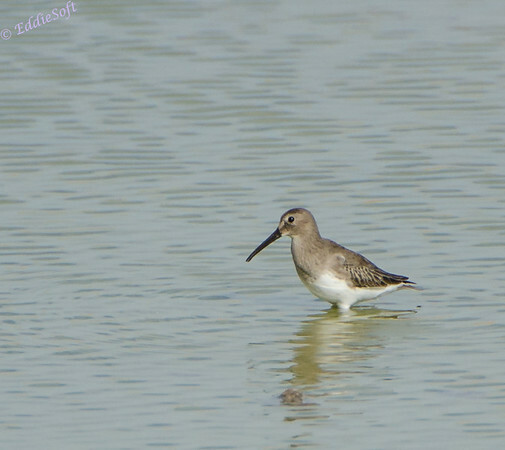 I was able to add another new check in the bird list with today’s blog entry. Anyone want to take a guess on what this might be? Really take a guess – a little validation would help me at this point. This little bird took me some extra time to eventually come to a consensus on what it was… or actually what I think it is. To accomplish this I employed my brand new bird reference guide I picked up while out in Yellowstone. While perusing the various gift shops in the park, The Stokes Field Guide To The Birds of North America caught my eye. It isn’t often a book on birds shows up I do not already have, much less ever seen. The key aspect of this particular reference was the ABUNDANCE of pictures. None of the books on my shelves come close to having the quantity of actual photographs contained in this book – in particular the fact it has shots of the female, the male, the juvenile and even seasonal and regional differences. Truly awesome and it was instantly “mine” – didn’t hurt we got a discount being Yellowstone Association members but truth be told I would have gladly paid full price (shhhh don’t tell anyone). 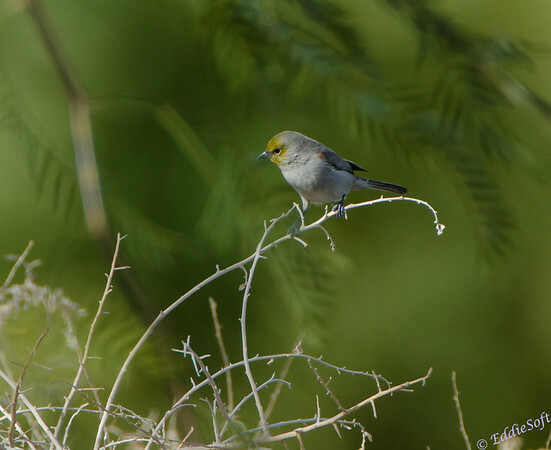 After about 40 minutes of thumbing through the book I decided to go with … drum roll .. a Verdin. The only concern was the region but a closer look (need a brush up on my state shapes) shows that it does venture into Southern Nevada. A friend at work (thanks John!) helped me verify the region today so thinking that concern is past me. As with any bird post at Lifeintrigued – you are more than welcome to debate any identification. So for now were going with a Verdin. This bird is especially cool since it doesn’t come anywhere near where I live making the trip that much more fruitful. 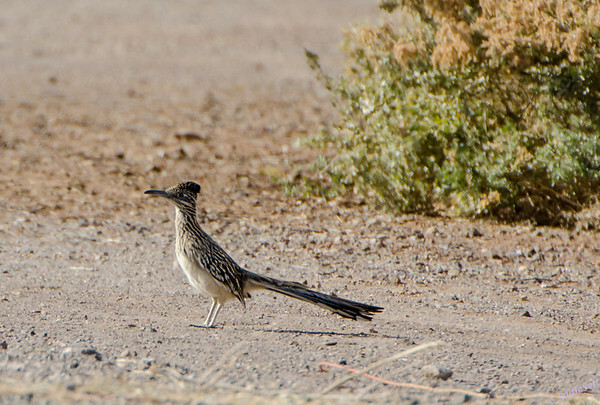 According to Stokes, this bird prefers desert scrub along washes and streams. The desert part was dead on and it was alongside one of their ponds which kinda fits the water reference. That is about the sum total of info I got out of the book. Again, that was purchased to help identify the bird, I have our friends over at Wikipedia and an abundance of info on the web to fill the data gap – finding out what the hell it is the real battle. Another site did mention they like thorny scrub – based on the shot above and the one below, this one was right at home. Hit the jump to read more about this cool looking bird. Another day, another post! Guessing the doubters are starting to get a little concerned (hehehe). I’m not out of the woods completely, but as each post rolls out through the publishing pipeline the stress ratchets down another notch. The good news in all of this is I was able to get started on another vacation’s worth of shots from last year. The great news is it looks like the topic hopper will be full for an extended period of time based on activities that has transpired as of late. Of course, this does have the downside of erasing all the gains made on the already overflowing topic queue. A very good problem to have when all your peeps have such high expectations. Speaking of queues, next pop from the stack places us back in Henderson Nevada, home of the Henderson Bird Viewing Preserve discussed a couple of posts back (link here). If you recall, that post introduced a new bird to the blog. Let’s continue that streak with still another new species. 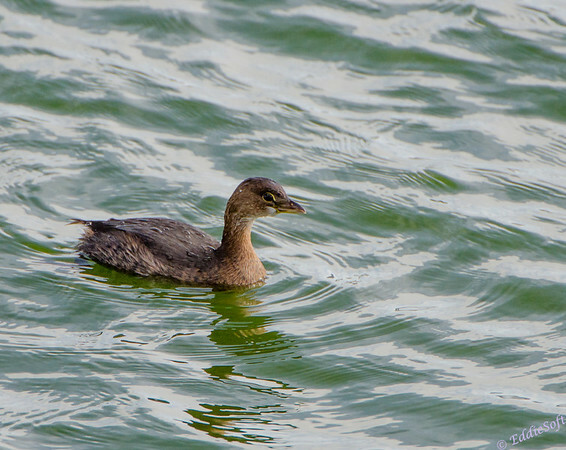 Most people will recognize this bird thanks to the numerous references over the years. If you are struggling, imagine it as a highly clever bird painted in blue and yellow. No help? How about Beep Beep? If that didn’t trigger the name, then clearly you did not watch enough cartoons as a kid. 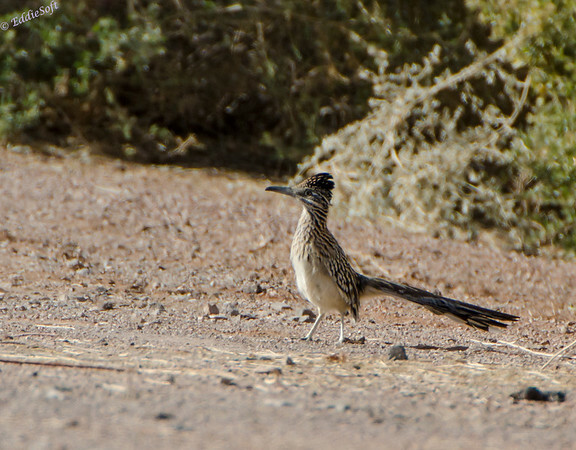 Just in case the suspense is too high, this is a Greater Roadrunner. That day in Henderson officially marked the first time I’ve ever seen a live one of these and to say I was elated is an understatement. After shooting the Green-Winged Teal, a blur of brown and white caught my eye dashing across the shoreline of an adjacent pond. Intrigued, I immediately headed over there and tried to get a decent shot. Let it be known that the amazing speed of these birds is confirmed. It could flat out move making focus tracking nearly impossible. Left, right, under brush, out of brush, to the water, back to the shore – it never seemed to stop. To get the shots here required some high shutter speeds combined with just a smidgen of luck. Tracking brown colored birds against a brown backdrop makes for interesting times with the Beast, but when you get it… you generally get it.